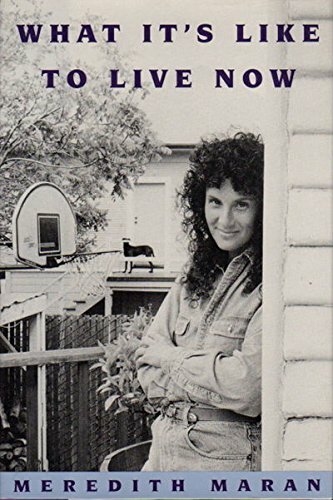 Like the heart-to-heart conversations you share with your funniest, most honest, most unshockable woman friend, What It’s Like To Live Now reveals the intimate details of life as it is being lived by one member of a singular generation. Reflected in the mirror Meredith Maran holds up to her choices and experiences, you are certain to catch more than a glimpse of your own. In 1968, Meredith Maran was expelled from the elite Bronx High School of Science for leading protests against the Vietnam war. She was an active member of the generation that pledged to change the world, end injustice, and stay young forever. Today (despite all expectations to the contrary) she is forty-three, with an ex-husband, a lover, two teen-aged sons and a mortgage on her dream house at the edge of the Oakland ghetto. One thing hasn’t changed, though: Meredith is still asking big questions. How do you justify your decision to stay in the inner city when your son wants to carry a knife to junior high to protect himself? How do you create a happy, healthy family when nothing in your childhood taught you how-and your new life partner is a woman? How do you keep your heart open when breast cancer and AIDS are attacking your closest friends? And how do you stay true to your hopes for a better world when there’s a living to be made and a homeless man at the front gate? Meredith Maran navigates these dilemmas without ever losing her subversive sense of humor. Whether she is challenging the nutritionally correct by baking her Death-By-Chocolate cake for her son’s birthday, or agonizing over what kind of nightgown to pack for her first weekend with a woman lover, her depiction of life’s contradictions is hilariously on target. What It’s Like To Live Now is a poignant, thorough-going exploration of the gap between the dreams of the sixties and the realities of the nineties-and a reminder that even as youthful idealism goes gray around the temples, there is much growth and joy to be gained from a life lived with love, commitment, and integrity. Welcome a strong new voice. Meredith Maran is alternately charming and confrontational, self-absorbed and politically engaged, fresh and shrewd. She’s always shockingly honest. Living with the contradictions and ambiguities of the modern American experience, Meredith Maran opens her life and exposes the naked truth of our existence. Well-written, alive, a book that should be read. Meredith Maran captures all the heartbreak and glory of coping in difficult times.